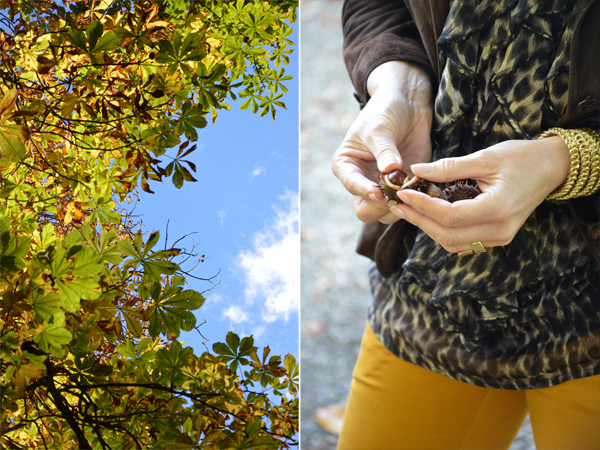 There are two sides of autumn – the grey and foggy days where you don’t want to leave the house but just stay on your sofa but also the ones where you want to embrace the late September and October sun, enjoy walking through golden leaves collecting chestnuts. Every time I get out my brown suede leather jacket, my daughter rolls her eyes 😉 But I cant help it, this jacket which I have for almost 20 years (seen here) is like an old friend in my wardrobe and I never even thought of getting rid of it! My new leather boots by Clarks via Shoetique complete my golden autumn look. Honestly, I’ve never had more comfortable boots! When Shoetique approached me, I was so happy to see that Clarks was amongst their fabulous selection of shoes as I already own a pair of platform heels which are equally comfortable! I recommend ordering them at least 1/2 size smaller than your regular size for a perfect fit. They are wide enough for tucking in my skinny trousers and I can even tighten them a bit when I’ll wear them with a skirt. Alena is wearing a pair of black quilted leather booties, also by Clarks. She is always on the run to university in central London, meeting friends at night and commuting between London and Munich. 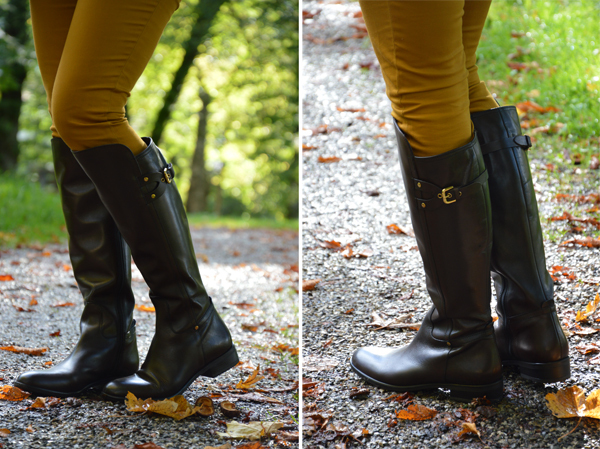 These will be her favourite boots this season and you can see her post on her blog meet me stylish! Der Herbst hat ja zwei Seiten – diese unangenehmen neblig-trüben, nasskalten Tage, an denen man das Haus gar nicht verlassen, sondern nur gemütlich auf dem Sofa sitzen mag und dann die goldenen, sonnigen Tage, wenn mag jede Minute draußen ausnützen möchte um die letzten Sonnenstrahlen zu genießen! Schon in meiner Kindheit gehörte Kastaniensammeln dazu und ich war immer enttäuscht, wenn die Buben sie schon mit langen Stecken vom Baum geschlagen hatten! Jedes Mal, wenn ich diese Wildlederjacke aus dem Schrank hole, verdreht meine Tochter die Augen 😉 Aber ich hänge einfach an der Jacke, auch wenn sie schon fast 20 Jahre alt ist. In einer anderen Version hatte ich sie hier schon einmal vorgestellt. Dazu trage ich meine neuen Lederstiefel von Clarks via Shoetique und ganz ehrlich, ich hatte noch nie so bequeme Stiefel! Als ich von Shoetique kontaktiert wurde, habe ich mich gefreut, dass sie auch Clarks führen, da ich schon ein Paar Pumps dieser Marke habe und das unheimlich angenehme Fußbett kannte. Ich empfehle Euch übrigens, mindestens eine halbe Nummer kleiner zu bestellen, mir passen sie dann immer perfekt. Der Schaft ist weit genug um eine Hose reinzustecken und ich kann sie auch etwas enger stellen, wenn ich sie mit einem Rock trage. auch von Clarks. Sie ist in London ständig unterwegs zur Uni, rennt zur U-Bahn und auch, wenn sie nach Hause fliegt braucht sie bequeme Stiefel, die natürlich trotzdem trendy aussehen müssen. In ihrem aktuellen post auf meet me stylish zeigt sie ihre coolen Booties. Fantastic fall colors! The mustard pants go so well with the rest of the outfit. 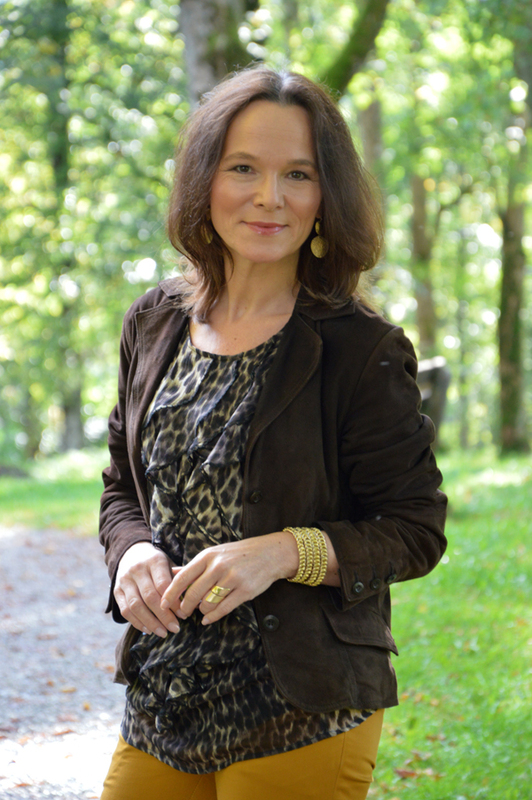 mir gefällt deine Jacke und natürlich sieht auch der Rest fantastisch aus. 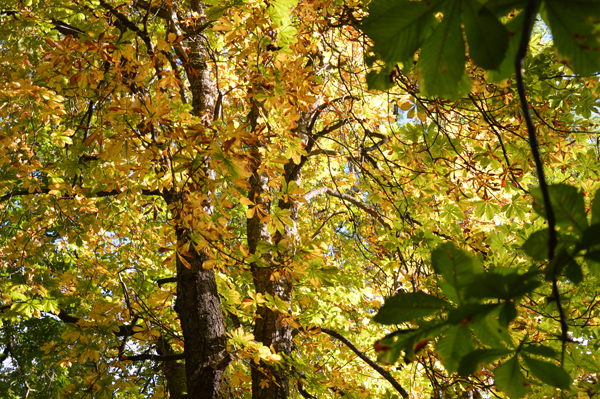 Tolle Herbstfarben und wieder mal ganz gelungene Bilder. Fabulous outfit! I love the fall colors. 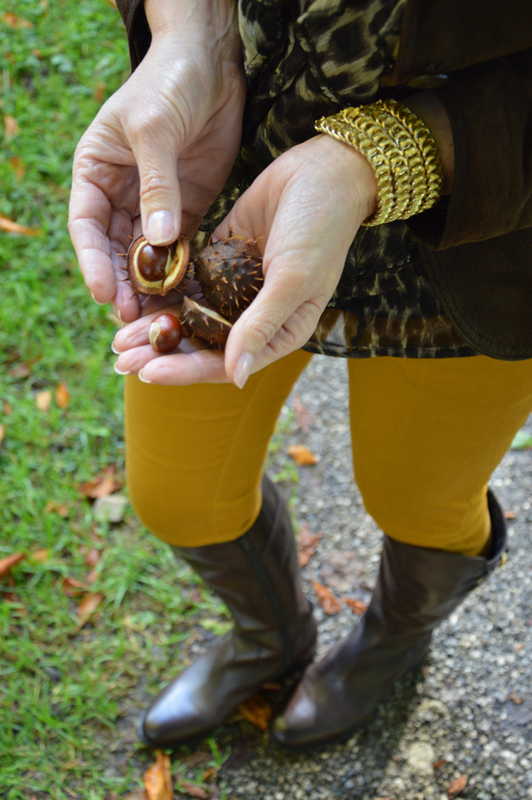 Love this post…so much autumn fun and your saffron pants are great! 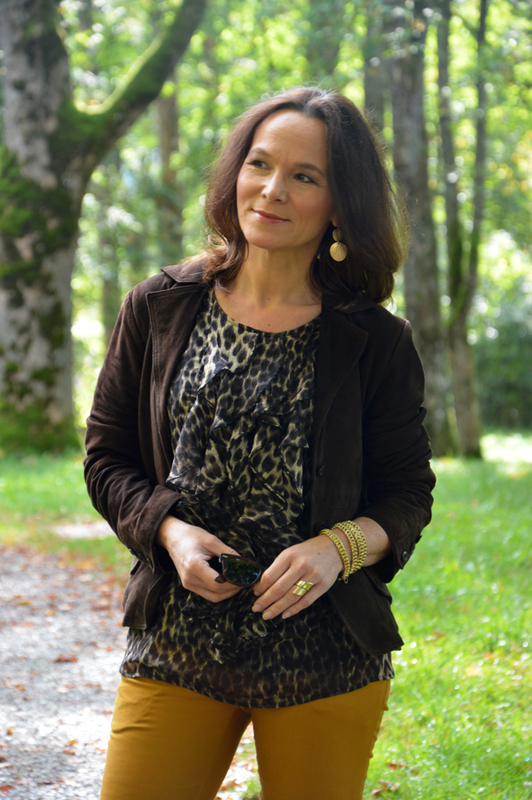 My recent post Susan Graver Style: A Sweatshirt to Love! I love that leopard top!! You look fabulous! Riding boots have always liked. They are beautiful and stylish and comfortable addition resutlan. They are perfect for your fall look. Never leave your jacket, it's a gem. Truly beautiful. du passt schon mal farblich ganz wunderbar ins Bild. Du scheinst dich komplett mit dem Wald abgestimmt zu haben, herrlich. Auch dein Outfit ist herrlich, wie ich es von dir gewohnt bin, passt alles perfekt zusammen. Selbst der Gold-Schmuck. Die Stiefel sehen klasse und bequem aus. Auch Alenas Look gefällt mir. Die Stiefel sind perfekt für sie. You look fabulous! I love a good cheetah print and I especially love that you paired it with the colored pants. Plus I'm obsessed with Alena's outfit as well. Love the pop of color from you both! I love these beautiful autum colors and your outfit colors as well look great on you and your daughter, you both look beautiful. I especially love your riding boots and the gold jewlery which I think compliments the autum colors so well. I love the leopard print with mustard. It's a great color mix. Such a fun fall look! You absolutely killed it. Love how you paired the mustard and leopard! Would have never thought it but they go so well! Perfect autumn outfit, perfect colours. And I keep hearing that Clarks has such comfortable shoes and boots. i have to try them myself. Love the suede brown jacket. I am similar colouring to you and also have a brown suede jacket in my wardrobe which I love and like you don't want to throw out! Thanks for the inspiration on how to style it.